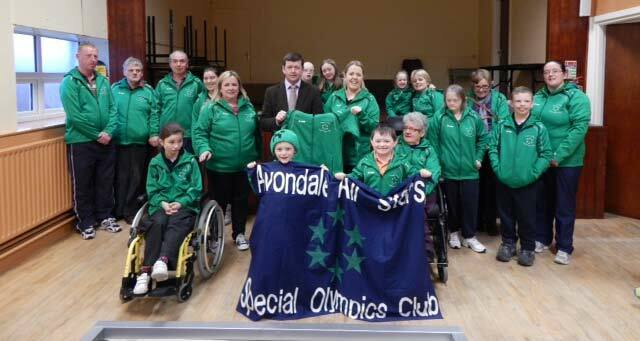 Last Thursday night a presentation of new club gear was held by the Avondale All Stars Special Olympics Club in the RDA Hall Rathdrum. The new club gear was presented by local County Council Candidate Pat Kennedy. The athletes were delighted with their new gear and wish to thank Pat Kennedy personally for kindly sponsoring the athletes gear from local supplier Ronnie Philips of BC Sports Ashford. Athletes from Arklow Vikings Special Olympics Club also attended the presentation and both clubs participated in some friendly games of Bocce and light refreshments afterwards. The Avondale All Stars Special Olympics Club is a sports club for people with an intellectual disability based in Rathdrum Co Wicklow. The club was started in 2011. At present Bocce is the sport played by the athletes. They hope to introduce new sports as the club grows. The club is about fun, friendships and team spirit. The athletes train on Thursday nights in the RDA Hall from 6.30-8.30. They currently have 16 athletes attending the club on a weekly basis. The athletes come from around the county and range in ages from 6 years to mid 50’s. They have two athletes Nicola Riley and Orla Mullen who will be participating in the Ireland games in Limerick in June 2014. This is a huge achievement for these athletes who are very proud to be representing their club and their county. Avondale All Stars Special Olympics Club are looking for new volunteers and athletes. If interested in joining please contact them at [email protected] or 086-6073700 or Facebook.